Which Blizzard Snuff Bullet will you choose? Snuff has been popular since it first came into prominence in the 1700’s and then, nasal snuff was pretty expensive and was pretty much used by the rich. Here in England, nasal snuff was many different snuff mills were in existence. In America at the time, which was an English colony the taking of snuff was extremely popular and they too had many snuff mills. Taking snuff takes very little practice, simply take a pinch from the tin between the thumb and forefinger, place it to the nostril and sniff lightly. Simple but we have a much better way for you to take snuff, very handy too far going out and about or going for a drink, particularly with the no smoking ban we have now. Our Blizzard Snuff Bullet allows you to take hits of snuff whenever you want with no mess, just like using an inhaler for nose blocked by a cold! 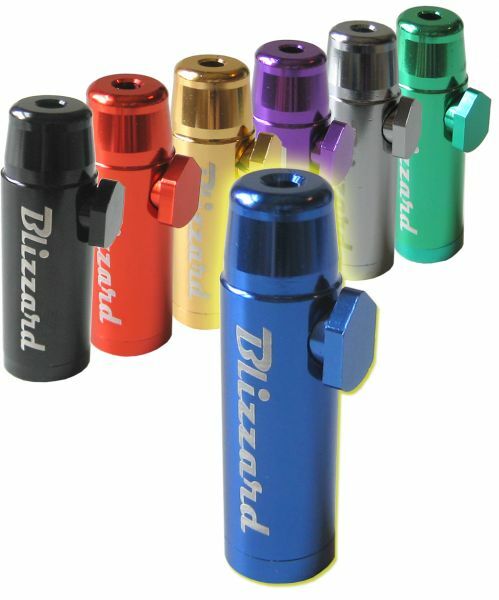 With a choice of several snazzy colours the Bullet is lightweight and very easy to use any time you want a snort. All you do is unscrew the base and fill it up with snuff, close it and twist the arrow so that it points downwards. When you want to take snuff hold the bullet upside-down and give it a flick to empty some snuff into the compartment. Then with the arrow pointing upwards and turn the Bullet so that he sniffing hole is at the top. Relax and enjoy the sensation of a pinch of snuff of your choice.